MANILA, Philippines – The Civil Service Commission(CSC) names new civil servants! CSC officially announced on Wednesday, May 16, the results of March 2018 Civil Service Exam-Paper and Pencil Test (CSE-PPT) also known as Career service examination. The complete list of passers for professional and sub-professional levels for Region 6 (Western Visayas) is available on this page. 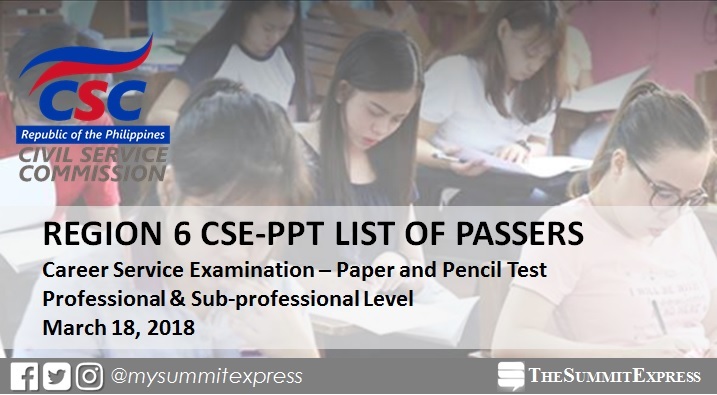 "Results of CSE-PPT are released 60 days after the date of exam," the Civil Service Commission (CSC) said on Friday, May 11. The first CSE-PPT this year was conducted on March 18 in 61 testing locations nationwide. View on this page the list of passers for the provinces of Region 6: Aklan, Antique, Capiz, Guimaras, Iloilo. For those planning to take on the next set of exam this year (August 12), the period for filing of applications will run until June 22. Applications should be submitted at the CSC Regional and Field Office where the examinee intends to take the examination.